How do you create work that brings the respect of the market, the value in your bank account, and the positive influence in the world? 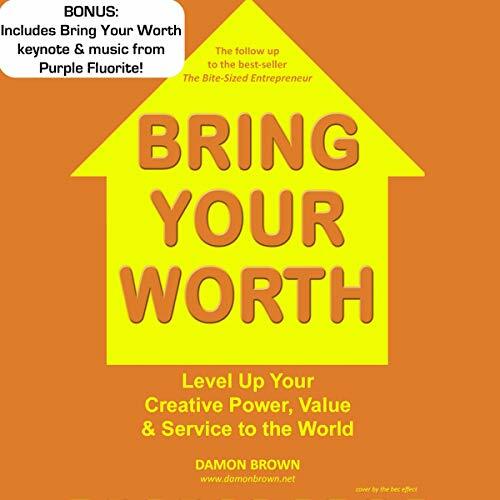 Inc. columnist and successful entrepreneur Damon Brown breaks it down in the thoughtful Bring Your Worth: Level Up Your Creative Power, Value & Service to the World. The follow-up to the best-selling series the Bite-Sized Entrepreneur, Bring Your Worth takes the proven methods from Damon’s keynotes and coaching practice and puts them into a strong, focused package perfect for both independents and traditional businesspeople interested in making their best impact in the world. Features the music of Purple Fluorite! Find them on Bandcamp!